I'm back from Europe! I took a vacation to Copenhagen and Paris (my first trip to Europe!) I spent a week in Copenhagen riding bikes, eating pastries, and checking out some beautiful modern buildings and then hopped on a plane and spent a little over a week in Paris, mecca of pastries, bread, and wine. I also ran a half marathon in Paris and accomplished a new personal record! No biggie! It was an eventful trip filled with beautiful architecture, many museums, lots of wine, and wonderful time spent with friends. All in all the trip was a great experience! I am editing my mountain of photos and hope to share them with y'all very soon! Today's recipe is from Meyer's Bakery, a fabulous bakery located in Copenhagen. My regret is that I didn't visit this place earlier in my trip. While I knew that the Danes really knew design, it surprised me how into pastries they were too. Going here and to Juno the Bakery, another very delicious bakery in Copenhagen, were definite highlights of my trip. I am happy to report that in in addition to the beautiful architecture, I also fell in love with their pastries. In Denmark these buns come with all manner of filling and topping: blueberry, chocolate, almond, pistachio, and cinnamon. Sometimes, like traditional cinnamon rolls, they even have frosting. These buns are similar to the very delicious Swedish Cardamon Buns Kardemummabullar which have a cardamon brown sugar filling and topping. The real highlight of this recipe is the addition of cardamon. Cardamon, a spice native to India, adds a great smoky and dark depth of flavor to the swirls amping up the spice of the dough. It is an unexpected and delightful surprise in a rather traditional cinnamon roll recipe. The key to making this dough is kneading swiftly and knowing when your dough is ready. I've written this recipe to be kneaded by hand, instead of a mixer. So get ready, your arms will have a bit of a fun workout! You'll know that the dough has developed enough gluten strength to rest when the butter is fully incorporated and the dough passes the windowpane test. To do the windowpane test, take a small knob of the dough (roughly a golfball size amount) and stretch the dough with your index fingers and thumbs. If you're able to easily stretch the dough into a thin transparent square (a windowpane) that you can see the outline of your fingers through without the dough tearing, then you're good to go! This means the gluten structure in your dough has developed sufficiently for it to begin its rest. If your dough tears easily and is unable to be stretched thinly, keep kneading and try again in a minute. Knowing when your dough passes the windowpane test is a valuable skill and very important for many other doughs as well, especially breads. It is very hard to over knead dough by hand, though the addition of the butter in the dough does complicate things a bit. I recommend working this dough with quick swift motions and on a cooler day so that the butter has less of an opportunity to become overworked and unincorporated (read: melted). Once you have mastered this dough, you will be well on your way to making other more complicated doughs like brioche, puff pastry and croissant. You're a badass! Eating these swirls brings me right back to my time in Copenhagen! I'm already eyeing a trip back and hopefully to other Scandinavian countries. I've written this recipe to be made completely by hand because my mixer was having issues processing the dough. To make this dough with a mixer: place flour, salt, cardamom, and yeast in mixer bowl and using paddle, mix on low. Add egg and cold milk and beat the dough on medium low for a few minutes until incorporated. Add sugar and beat the dough until it is smooth and cohesive about 7-8 min. Change to dough hook and with mixer running on medium, begin to incorporate pliable butter, one tablespoon at a time. Knead the dough until all butter is incorporated and the dough is very smooth, shiny and cohesive, and roughly 8-10 more minutes. Dough should pass the windowpane test. Continue to step 3. Place flour, salt, cardamom, and yeast in a large bowl and using a whisk, mix together. Add egg and cold milk and using a plastic scraper, mix for a few minutes until it becomes a shaggy dough. Add sugar and mix the dough until it is cohesive. Dough will be very sticky, and lumpy still, about 7-8 min. Meanwhile, place the butter on the counter. Using a rolling pin, beat the butter until it is very pliable, but still cool. Pour dough onto the counter. Using scraper, smear some of the butter over the dough. Continually fraisage the dough using palm of your hand adding the rest of the butter a few tablespoons at a time. Knead for about 8-10 minutes. The slap and fold method works well to help incorporate the butter and begin to develop the gluten. The dough will be very sticky initially, but as the dough gets kneaded and the butter becomes incorporated, the dough will be very smooth and shiny. The final dough should still be very cool to the touch and should pass the windowpane test (see image above). Place dough in a greased bowl, cover with plastic wrap and let rest for one hour at room temperature. Then, refrigerate the dough for at least one hour or overnight. Make the filling: while the dough is resting, beat the butter until very soft with a whisk. Stir in the sugar and cinnamon together until incorporated and set aside. Place the chilled dough onto the counter and roll it into a rectangle approximately 12" x 24", with the short edge parallel to the edge of the counter. Using an offset spatula, spread the filling evenly over the dough. Cover two cookie sheets with parchment paper. Fold the top third of the dough down over the middle. Fold the remaining third of the dough over the folded third, like a business letter. Using the rolling pin, press the dough lightly to adhere the layers together. Cut the dough into 12 strips, each approximately one inch wide. Take one dough strip. 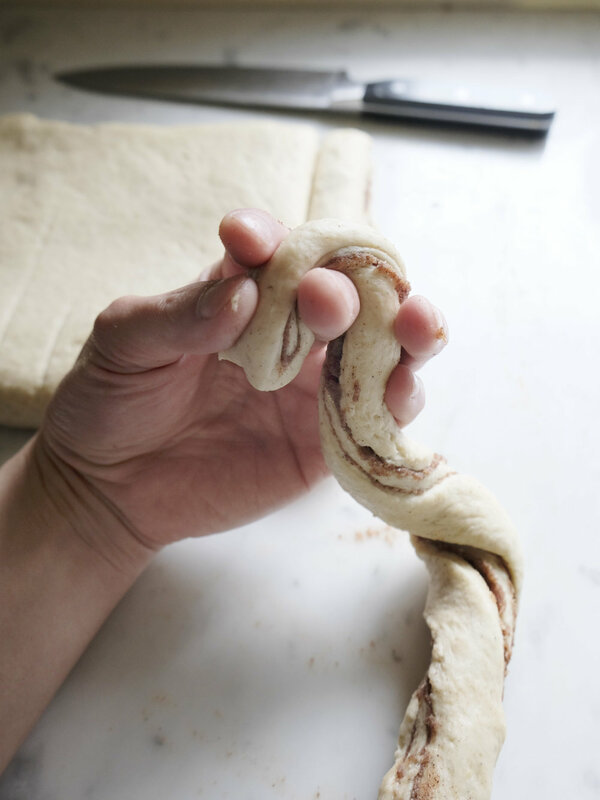 Hold onto one end and twist the dough with your other hand while stretching it. Twist the dough six to seven times. Place one end of the twisted dough between your index and middle finger and wrap the dough twice around your fingers. Pull the end of the dough over the twist and into the center and pinch with your middle and index fingers. Arrange swirls on prepared sheets above three inches apart, roughly six per sheet. Preheat oven to 400°. Cover the swirls lightly with plastic wrap and let rise at room temperature until enlarged in size and an indent in the dough pushes back slowly and slightly, about one hour. Lightly beat remaining egg, add a pinch of salt. Brush the cinnamon swirls with egg wash and sprinkle top with pearl sugar or sparkling sugar. Bake for 13- 17 minutes until very golden brown. Cool on tray for five minutes then place on a wire rack. Serve warm or at room temperature.